GRAND CENTRAL TEXAS is an economic development partnership that promotes business development and provides services to businesses interested in locating to the six county region. By working closely with our local, regional and state partners, the partnership can assist with locating a site or building, gathering detailed business cost and economic data and securing a competitive incentive package. With a convenient location, low cost of doing business, diverse workforce and abundant resources, the region is becoming a sought-after area for business development and company relocation. 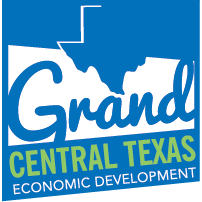 The Grand Central Texas partners are recognized regionally and nationally as one of the country’s most professional and progressive economic development organizations. The Partnership works collaboratively and strategically to facilitate increased prosperity through business development while enhancing the business environment and quality of life in our region.